Lune OS aims to be an unobtrusive personal assistant - ready with details, but never paternalistic. It focuses on people, not the providers of their on-line services, nor the idiosyncrasies of the computer systems they use. Using a LuneOS device is a dialog between the user and the device: the alternatives available depend on the data, the user's recent input, and the user-chosen information sources. It does not use an opaque profile gleaned by monitoring users communications (and sold to the highest bidder). It is deterministic, not based on experimental Artificial Intelligence. Consider two incoming messages (handling should be similar whether they arrive via IM, email, Twitter, Facebook or something else). Relevance is decided by the user, not some algorithm with biases baked-in. Alice says "ABC is the greatest thing since sliced bread". The user, unimpressed, swipes left to "dismiss" it. Alternately, the user doesn't select anything and swipes right, copying the whole message to Just Type. Nothing matches the whole message, but a pattern matcher offers to open the Calendar to "tomorrow". Because the message is longer than a typical search, that's immediately followed by Quick Actions such as New To-Do (containing the text) and New Calendar Event. Alternately, the user selects Carol and swipes right. Just Type displays all the Carols from the users contacts and groupware such as Slack or Basecamp. The user taps on the correct entry, and the system displays contact info for her, perhaps containing notes which make clear why Carol is the person to talk to. Because LuneOS promotes moving info from one app to another, users can see something on a public channel, and reply on a private channel. This helps avoid public shaming, making the user a better member of his/her communities. Assume the user has multiple accounts (and will add and drop accounts over time) that provide similar services. Humans can only attend one event at a time, so the Calendar displays events from multiple servers on a single time-line. Tapping a person's name in Universal Search shows you various ways to contact that person (for example email, IM or phone). The Messaging app threads together all messages from the same person, regardless of different services. When a popular new service emerges, favor writing a Synergy Connector over writing an app. If the service provides a good mobile web app, there's no point in writing an app at all. Messaging Synergy Connectors should create contact records for IM buddies. Synergy will associate existing contact info. Project Management software (such as Basecamp) should create contact records for everyone on the user's projects. This won't clutter listings, because searching in the phone app only shows contacts with phone numbers, searching in the email app only shows contacts with email addresses, and so forth. Favorite contacts allow the user to curate a short list of contacts. To-do and Project Management software should create Calendar records for any hard deadlines. Social networking software should use the media APIs, so shared photos and videos are just as accessible as the camera roll. Tapping a URL, email address, messaging address or telephone number, listed by an app should open a http:, mailto:, im:, or tel: URL. Allow the user to use his/her existing data and documents, to the extent possible. Carefully consider import and export of data. Cache data, so your app is usable offline and has something to display as soon as launched. LuneOS-specific apps should use DB8, cross-platform apps can use IndexDB. Use DB8 Watches so your UI stays current. Apps MUST work on both phone and tablet form factors. Sharing and sending user data off-device must be opt-in, not opt-out. Permissions must be appropriately granular, and changeable from the context where users care about them. Save user's data as you go; don't have an explicit Save button. Allow users to reverse mistakes. Archiving doesn't require confirmation. Permanent deletion generally should be a two-step process; favor archive & purge (like the desktop trash can) over "Are you sure?" dialogs (where users reflexively click OK). Note that "deleting" a DB8 record only sets the _isDel flag; records are periodically purged by the system. Allow users to partially-complete items (to the extent possible). Assume users pick up a device with a goal in mind. If the system needs the user to make a decision, don't use modal UI unless absolutely necessary. Figure out what "back" means for your app, and hook it up to the back gesture. For example, switching to a panel that's logically "earlier", or clearing search text, so the full list is displayed. Single-tapping a list item should show the full item. Long-press (tap & hold) either selects for re-arranging or re-sizing, or opens a context-sensitive menu. Basic operation should not require long-presses. Double-tap, spread, and pinch are mostly used in the browser and pictures. Each preference needs a strong justification to exist. Only have preferences that users care about (for example, sorting by surname or given name). Go the extra mile to manage details automatically. For example, the Email app can usually figure out if a provider supports IMAP or POP. Enyo 2.7 apps can use InputSearchStretch to include a search field without taking up much screen real estate. Search should have a single text field; no additional selectors or Search button. Normalize search terms by folding case and ignoring irrelevant punctuation. Typically, match against the first part of words. Typically, space-separated search terms are ANDed. OR is not directly implemented, but search should be so fast that users can backspace and search a second term. Approximate matching and ordering the results by relevance my be possible in some cases. Search all appropriate database fields. For example, search in Contacts matches by given name, surname, middle names, first initial+last name, nickname, organization, email addresses (before the @-sign) and messaging addresses. If items can be selected by tags or categories, provide an all-tags or all-categories listing. Favor a model where items have multiple tags, over items having a single category. Make it easy to push text to the Universal Search field, for re-use by other apps. Buttons on dialogs and toasters should have action verbs, for example "Send", "Delete", or "Cancel". Avoid "Yes", "No", and "OK" if you reasonably can. A couple buttons with short labels can be arranged horizontally, if they fit on a phone-size display. Long labels or multiple buttons should be arranged vertically. For right-hand operation, place "Cancel" the the left hand side. Reverse this for left-hand layout. Use color intelligently. Half or fewer of the buttons should be colored. For example, use classes: "onyx-affirmative" on a Send button, or classes: "onyx-negative" on an irreversible delete. See Creating Usable UI - Buttons (but note the code is Enyo v1). Make users' hastily-scribbled notes look good. Set max-width on columns of text to 35em. Set left and right margins to auto, so the column will be centered. In place: input text turns red, message next to group of controls, etc. Banner messages (transient; unstyled text + small icon; can send when app minimized; tapping re-launches app) banner message image Only one banner can be displayed at a time. The system displays a banner for five seconds, or two seconds if another banner is queued up. While a banner message is displayed, it takes the place of the Notification Bar. Notification Bar (a narrow bar of icons) Only available in conjunction with Dashboards. On phones, appears at the bottom in portrait mode, only when one or more Dashboards exist. Tapping it hides it and displays all Dashboards. On tablets, always appears at the top of the screen, in either landscape or portrait mode. Tapping it leaves it visible and displays all Dashboards. Dashboard (non-modal; associated with icon in Notification Bar; can be created when app minimized; persists until dismissed by user, even if card dismissed) Can contain controls. System popup (non-modal but intrusive; only one per device at a time; can open when app minimized; persists until dismissed by user, even if card dismissed) Must contain controls. Flashing LED (on some hardware). The system starts flashing the LED when a dashboard or system popup is created with the screen off. The LED only flashes until the user turns the screen on. Help users resolve problems themselves. For example, if a backup directory can't be written, tell the user "Pick a different backup directory" and display a file picker. Messages that relate to one control or group should be adjacent to that control or group. Status info (such as the time of the last successful sync) should be in a Drawer or pane "deeper" in app navigation. If the user must make a choice, use a non-modal toaster. Apps should not use System Popups for warnings nor errors. When new items are added via sync, an app may create a dashboard. 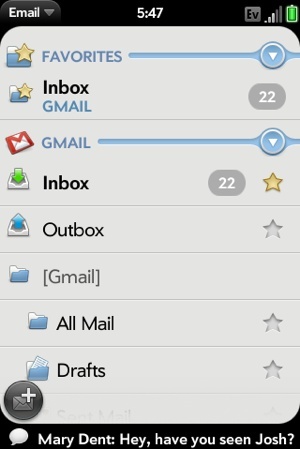 For example, sync of email creates a dashboard when new messages arrive, but sync of contacts does not. When an app creates a dashboard, it may also send a banner message. Example: Messaging. Counter-example: Email. A to-do app may create one dashboard to remind users of all tasks scheduled for today. "Notification" dashboards should be standard height. Typically, they have an icon on the left, with a badge for the number of new items. Tapping this typically opens the a card to a list of items. On the right, the text of one item is displayed. Tapping this opens a card showing that item in full. System popups are used when it is urgent that the user make a choice. For example, answering an incoming phone call or letting it go to voicemail. The Calendar app opens a system popup to remind users of imminent events, that the user asked to be reminded of. If the user needs to take action in seconds, use a system popup with sound/vibration. If the user needs to take action in a few minutes, use a banner message + dashboard with sound/vibration. If the user needs to take action in minutes to hours, use a banner message + dashboard. If the user needs to take action today, use a dashboard. Events that originate with the user may use more intrusive notification than events that originate elsewhere. Apps may put controls in a Dashboard for quick access. Example: When the music player is minimized, it creates a dashboard with play/pause, next & previous buttons, and the song name and artist. Apps that are primarily used via a Dashboard or System popup are called "desk accessories". When launched, such apps typically display a card with instructions. "Desk accessory" Dashboards that the user initiates may be taller than standard. Avoid negative phrases ("invalid account", "server error"). Minimize superfluous words like "please"
Technical details should be hidden behind a disclosure triangle. Cross-fades are often used when switching to info at the same level. Only use multiple cards only for separate user tasks. For example, composing an email uses a different card than reading received emails. While not maximized, apps continue to run. They should detect minimization events, and stop animation and other expensive operations. setTimeout calls will return, but the timeout will be many times the specified one. The main user interface in a webOS Ports app generally focuses on a screen size-aware enyo.Panels kind and a gesture area (virtual or otherwise). Commonly, the top-level layout uses an enyo.Panels with a CollapsingArranger, which adapts to both tablet- and phone-size screens. The first panel, which is referred to as the Menu Panel, should contain the app's main menu. The second panel contains the content associated with the main menu's options. This is the Content Panel and it usually starts off blank. Most often a second enyo.Panels kind is nested inside this one to allow for easy transitions between content. Analyze whether Intents would simplify your app. [Siempo] has a few interesting features we might want to have a look at. This page was last edited on 23 October 2017, at 20:27.